It’s not often an Air Evac Lifeteam crew has the opportunity to meet a patient and witness his or her recovery. So when San Marcos, Texas, resident Megan d’Andrea walked into the La Grange, Texas, Air Evac base, it was cause for celebration. Megan, a PE teacher at Harmony School of Innovation in Austin, was traveling along I-10 when she came up on a construction zone. The speed, she said, dropped from 75 to 50 miles per hour, and traffic merged quickly. Megan hit the back of a flatbed 18-wheeler. The driver saw her and let go of the brake, moving forward so Megan’s car would not go under the semi-truck. 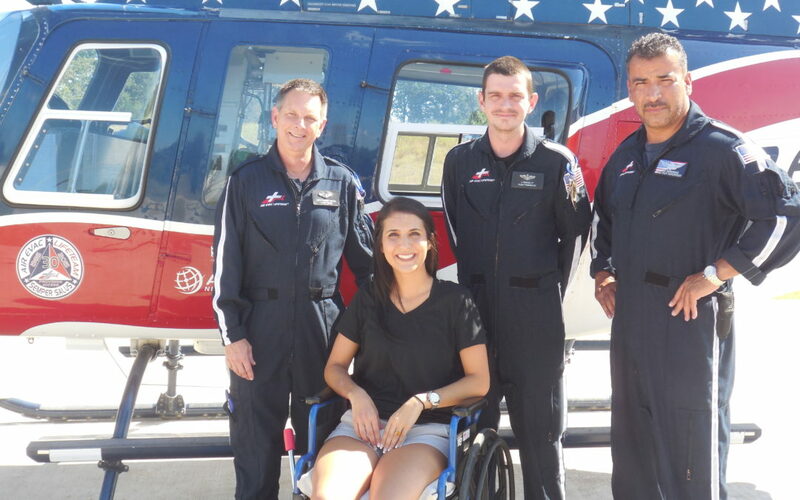 Megan was trapped in her car for 30 minutes, and the Air Evac crew of pilot Jose Hernandez, flight nurse Keith Hughart and flight paramedic Joe Percer landed on the interstate. Keith said four agencies were on the ground, working together to try and save Megan’s life. The Air Evac crew administered an experimental drug known as TXA, which slowed the bleeding and bought Megan some time. Trauma patients who reach a higher level of healthcare within the “golden hour” are more likely to survive. Megan was flown to the University Medical Center at Brackenridge in Austin, where she went straight into surgery. The skilled surgeons worked to stop the internal bleeding and put the young teacher back together. In September 2015, Megan visited her uncle, recovering from gall bladder surgery at St. Mark’s Medical Center in La Grange. Knowing the crew that flew her to Austin was from LaGrange, Megan visited the base after seeing the aircraft land. “They acted so fast, and are a big part of saving my life,” she said. Meeting Megan was emotional for all three crew members.